Aerosmith frontman Steven Tyler joined Taylor Swift to perform the band’s 1998 hit, “I Don’t Want To Miss A Thing”, at the Bridgestone Arena in Nashville, Tennessee on Friday. Written by Diane Warren, the tune appeared in the film, “Armageddon”, and delivered the Boston band the first and only No. 1 US hit single after 28 years as a group. "I don't know what else to say,” said Swift in her guest introduction, “but when you've sold over 150 million albums with your band, when you have become an absolute rock n' roll icon. "The person that's about to come out on stage has been inducted into the Songwriters Hall of Fame and the Rock & Roll Hall of Fame with his band Aerosmith. 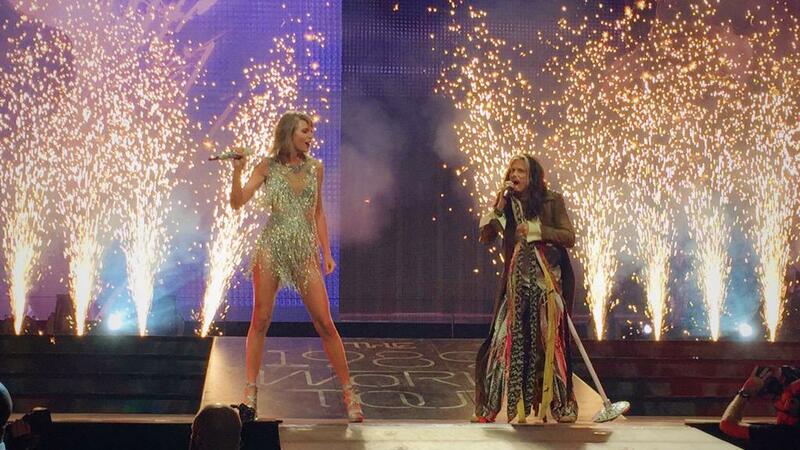 Steven Tyler's here, Nashville." Tyler has been based in Nashville for much of the past year as he works on his country-flavored debut solo album. Tyler’s connection to the city grew larger this past week when he made a guest appearance on the season 4 premiere of the ABC-TV series Nashville. The singer performed a cover of the Willie Nelson song, “Crazy”, with Hayden Panettiere, who plays Juliette Barnes on the show.